1899年11月27日罗德西亚寄西藏实寄封，贴罗德西亚邮票销津巴布韦圆戳，旁盖大吉岭海关椭圆戳并有手写”重要”，”转发”及”未知”字样，背盖数个中转戳包括哈拉雷、德尔班、海上邮局、噶伦堡、印度锡金邦等。少见由罗德西亚经印度寄往西藏邮件。。 Tibet Cover 1899 (27 Nov.) envelope from Rhodesia addressed to "His Mightiness, The Mogul, Tibet" with "Important" and "To be Forwarded", bearing Rhodesia Arms 1896-97 ½d. and 6d. 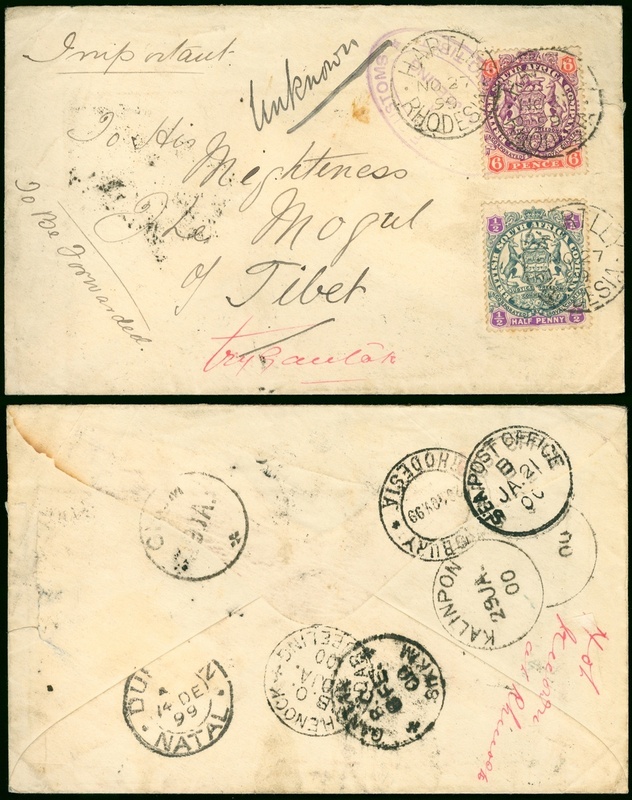 tied by Hartley c.d.s., Darjeeling Customs h.s., with manuscript markings, "try Gautah" and "unknown", on the reverse, with several transit c.d.s. Salisbury (29.11), Durban (14.12), Sea Post Office (21.1), Kalipon (29.1), Rhenock (30.1), and Gantak (3.2). An intriguing cover, very little mail originates in Rhodesia.